Get the best of both worlds with our SuperBuck n Slug 12 gauge rounds. 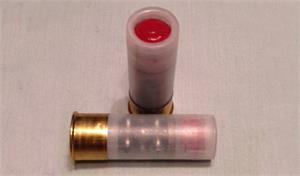 Each round contains 9 00 buckshot AND a 7/8 oz 12 gauge sabot slug for a combined payload weight of 2 ounces!!! The sabot slug can pass through a full choke and you could fire this round through a rifled barrel though we don't suggest it as the buckshot would have a WIDE dispersal.